We can help you with just about any service that affects your dental health or enhances your smile. Select a topic from the menu on this page for details about our services. Crowns can be made one of three ways: all porcelain, all gold, or porcelain fused to metal. Porcelain crowns are typically used for front teeth. This option is the weakest of the three as it does not contain any gold, but it provides the best aesthetics for crowns of the front teeth. Gold crowns are most often used when placing a crown on back molar teeth. The gold is very durable, and therefore a great option for those who clench and/or grind their teeth. Porcelain-fused-to-metal crowns might be likened to an M&M, with gold as the chocolate underlayer and porcelain as the outer colored shell. This type of crown provides both strength and aesthetics. When deciding which type of crown is best for you, Dr. Seneczko will discuss all the pros and cons and together you will discover your most suitable option. The first appointment is the longest. 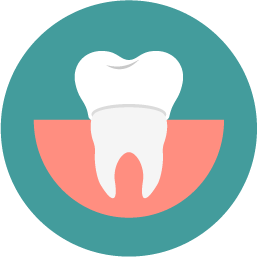 The tooth is prepared by removing the necessary amount of tooth structure. An impression of the tooth is then taken, which will later be sent to the dental lab where the permanent crown will be made. The last step of the first appointment is placement of the temporary crown. The second appointment typically takes place approximately two weeks later. This appointment is shorter. The temporary crown is removed and the permanent crown is cemented and any needed adjustments are made. Copyright © 2019 Seneczko Dentistry. All Rights Reserved.